The key to an easy move is careful planning. There are steps you can take, from two months before the move until moving day, to make sure you have all your bases covered and eliminate potential stress. Use this checklist so you won't overload your schedule or mind, and even save some money. Get estimates from at least three professional movers. If you are going to do it yourself, get prices on rental trucks. After you receive estimates and make your decision, coordinate and book services early, especially if you're planning your move around a holiday week/weekend. Decide which furniture and household goods you'll be taking and which needs to be disposed of or sold. Be sure to note what needs to be replaced if you get rid of something. If you're moving to a new city, contact the Chamber of Commerce for a new residence packet. Your real estate agent may also have information. Make an inventory of your possessions besides furniture, such as kitchenware, decorative items, electronics, apparel, etc. Complete a change of address form with the post office (this can easily be done online). Notify organizations, credit card companies, and any magazines or subscriptions of your new address. If children are changing schools, arrange for transfer of educational records. Itemize moving-related costs with the mover including packing, loading, special charges, and insurance. Make arrangements for packing your belongings. If you're using professional movers, schedule for packing to take place a day or two before the move. 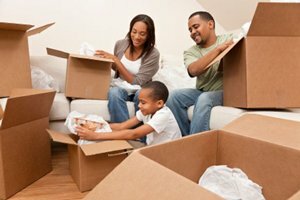 If you’re handling packing on your own, purchase adequate boxes, packing materials and tape. Arrange for short-term or long-term storage if needed. Make travel arrangements for pets, including getting necessary medical records, immunizations, and medications. Begin packing items you won't need immediately or that will go into storage. Contact utilities on both ends of the move to order termination or turn-on for occupancy date. If necessary, arrange and confirm new bank accounts and local services in your new neighborhood. Gather important papers, records, and valuables for protected shipment to new home or safe deposit box. Obtain any prescription medications needed for the next few weeks. Defrost refrigerator/freezer and give away all perishable food. Keep a box marked "Last Box Packed/First Box Unpacked" for tools, flashlights, first aid kit, etc. On moving day, this should be the last box placed on the truck. Pack items to carry with you such as valuables, financial records, personal papers, etc. Give the movers a telephone number and address to reach you.